Lilly Pillies are popular as a hedge and are easy to grow in many areas of Australia. Lilly pilly or ‘Syzygium’ bush christmas, cascade, hinterland gold and big red are all popular wholesale Lilly Pilly cultivars. Grown widely as hedges lilly pilly also mage a good feature plant at the back of the garden border. 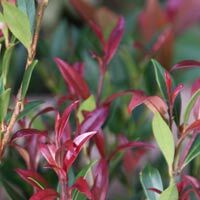 Species known as lilly pilly include : syzygium australe, acmena smithii and syzygium luehmannii and the “Weeping Lillypilly” or Waterhousea floribunda all loosely named as Lilly Pilly. Lilly Pilly varieties have been developed and hybridized to provide a wide range of forms with many different characteristics. Lilly Pilly Acmena Smithii ‘Forest Flame’ (picture right) is a compact growing plant well suited for a low hedge, the brilliant new crimson shoots are a feature. Most development has been with providing smaller growing lilly pilly varieties for the home garden and for hedging as well as improved color and better weeping forms such as Waterhousia floribunda or ‘Weeping Lilly Pilly’ . syzygium australe, syzygium luehmannii, syzygium cascade, syzygium paniculatum, syzygium smithii, syzygium jambos or ‘Rose Apple’ (Malabar Plum). waterhousia floribunda It is essential when choosing a Lilly Pilly to consider what you are looking for as an addition to the garden. Psyllids, a little (native) sap sucking parasite are about the only problem that Lilly Pillies face. They can be controlled by spraying. We suggest looking for psyllid resistant lily pilly cultivars and species. Acmena smithii and Syzygium luehmannii are said to be resistant. Many Lilly Pilly varieties are suitable for hedges. Acmena Smithii is perhaps the fastest growing and if planted 80cm – 90cm apart will form a dense screen in 4 years (depending on conditions). 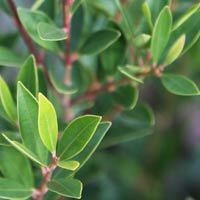 Lower growing cultivars such as ‘Tiny Trev’ make great small screens or hedges. Once established prune one a year, early spring is a good time. However, new lilly pilly hedges should be pruned twice a year to help promote a bush growth habit. Try to prune when the weather is not to hot, and in the late afternoon if possible. Fertilize after pruning in spring, and again in early autumn, water well before fertilizing and again after application. Use an all purpose slow release fertilizer formulated for australian native plants. MEGAN’S HEDGING PLANTS….. BACKYARD BLISS Lilly Pilly – Phone Megan 0428297339 Mid North Coast, Laurieton NSW Sensational new hedge / screen. Psyllid resistant, exceptional dense fast growth. Various sizes, wholesale prices. CARAWAH NURSERY – phone: 59674244 fax: 59674239 15 Falls Road Hoddles Creek Victoria 3139 Wholesale propagators specialising in Australian Native Tubestock. Our list comprises of hard to grow and pictorial lines. Monthly & Annual Forward Order catalogue. Accredited to all States.